Sammy Cuomo always knew he wanted to work in television. After graduating from Palomar with a degree in Media and Communications, he is on his way. SAN MARCOS — From an early age, Sammy Cuomo was the type of kid who would reenact scenes from his favorite cartoons for his family. He seemed destined for television. By the time he graduated from Palomar College this summer, he was on his way as a member of the production team at KOCT in Oceanside. 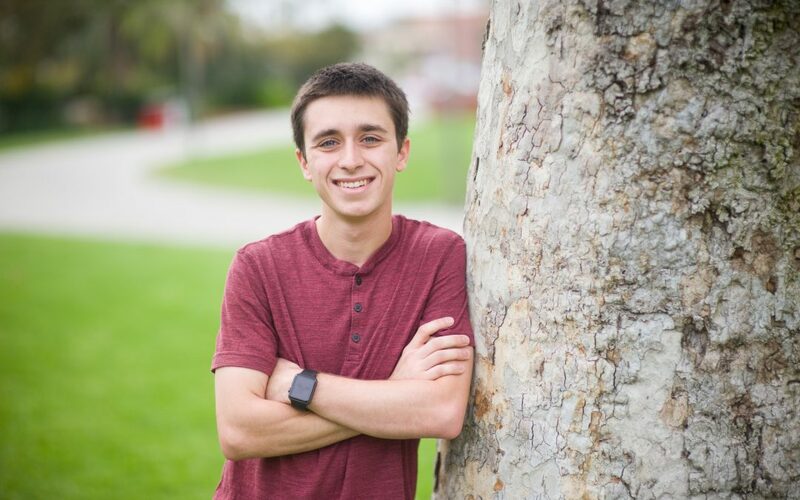 Cuomo, 20, now attends California State University San Marcos (CSUSM) after earning his A.S. in University Studies with an emphasis in Media and Communication from Palomar. On a recent afternoon, he recalled how his childhood obsession took on a new shape when he discovered the film and television program in high school. At Mission Vista High, he hosted a monthly broadcast and began learning the technical skills that he would later strengthen as a student at Palomar. Lisa Carmichael, a faculty member in the Digital Broadcast Arts (DBA) program, said that dozens of graduates like Cuomo have made their way from the college’s studios and editing rooms into industry jobs. Besides KOCT, she said the program has seen several of its recent graduates hired by KUSI, with others in coveted positions around the country. Cuomo said he didn’t set out with a career path in mind, but that Palomar’s DBA program prepared him for the position at KOCT, which began last year as an internship. Now, as a Communications major at CSUSM, he said he is looking forward to a full-time job in the television industry. That hands-on experience landed him behind the switchboard during KOCT’s live coverage of Oceanside City Council meetings earlier this year; anyone watching a council meeting from home was in Cuomo’s hands as he toggled between cameras in the room.